The beautiful, but wicked, Queen Maybelline has stolen the castle young Snow White’s mother left her, and has made Snow White her servant. When the magic mirror announces that Snow White is now the fairest in the land, Queen Maybelline is very, very angry and determined to get rid of her by any means – including poisoned apples. Will Snow White’s friends rescue her from the evil Queen? Can they protect her from Max the Axe? And what has happened to the seven dwarves? No baboons or Cornish pasties appear in this pantomime, much to the dismay of an unknown voice which calls out at the beginning. 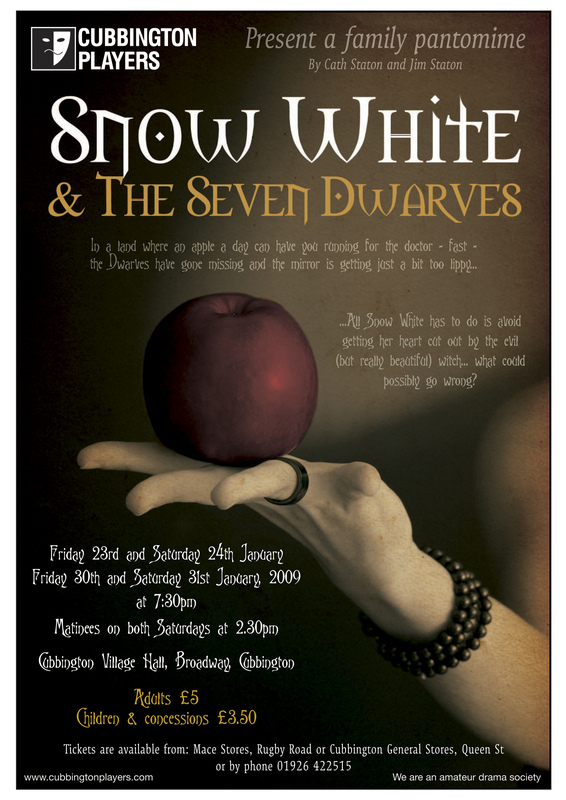 What does feature is an amateur theatre company trying to out-do one another in silliness, a shamelessly thin storyline based on the fairytale of Snow White and her seven vertically-challenged friends and a number of pop songs parodied to obliteration. Peter Kay and his cronies at the Phoenix Club could not have provided more random hilarity – the piano was barely in tune, the characters had names like Cillit Bang, nobody could sing and Eric Carmen’s All By Myself was turned into “Tall as an Elf”. Ridiculousness aside though, this was all harmless fun, aimed almost purely at children. And in this way the Cubbington Players did a very good job. Some moments made you laugh, others say ‘awwww’ and others try and look away so not to cringe. Teresa Coles McGee as the witchy Queen Maybelline was spot on as the narcissistic villain and James Suther, a giant of a man, was perfect as the monstrous bad guy – turned gentle hero, turned Welshman, Irishman, American, and Cockney – Max the Axe. Free sweet giveaways and a lovely happy birthday dedication more than made up for the lack of a furry primate or a savoury pastry snack in this show. And the production ultimately succeeds in its aim of prolonging the Christmas spirit by raising money for charity while ensuring people have fun.